To promote excellence in leadership, academics and physical fitness by recognizing the overall outstanding graduates of professional development courses (e.g., ALC, SLC, WOBC, WOAC, BOLC, AGCCC, and Senior Human Resources Management Course for 42A, 42B, 42H, 42R, 42S, 79R, 79S, 79T, and 79V). Any Commissioned, Warrant, or Noncommissioned Officer who is an Army AG or HR student when the recommendation is made. As established by the host Army school which determines the overall outstanding course graduate based on leadership, academics, and physical fitness. This award is for outstanding performance in leadership, academics and physical fitness while attending basic and advanced level Army AG / HR training. The award is presented in recognition of President Benjamin Harrison and Fort Benjamin Harrison as the original home of the Adjutant General’s Corps. 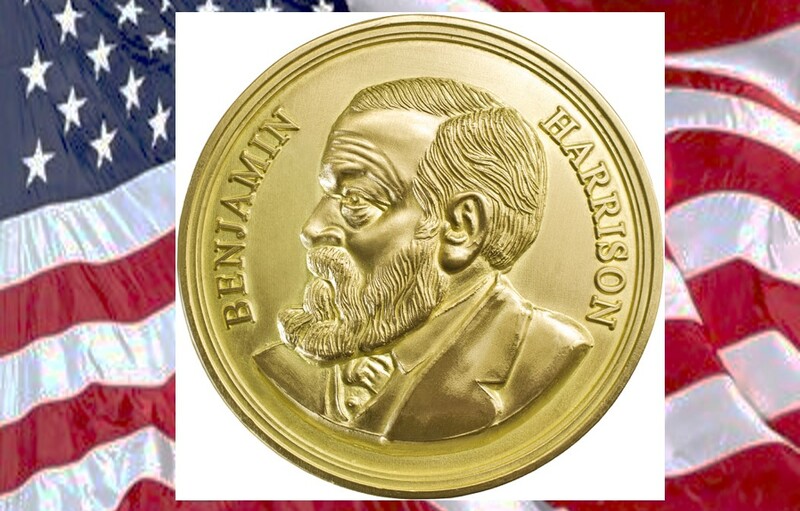 A replica of the original Presidential medal honors President Harrison’s name. Army School Commandants, Directors, or their appointed representatives will recommend each qualified student to the Adjutant General’s Corps Regimental Association. This recommendation will be forwarded by email (preferred method) to awards@agcra.com or mailed to the Adjutant General’s Corps Regimental Association, ATTN: VP for Awards, PO Box 10026, Fort Jackson, SC 29207-0026. The AGCRA VP for Awards will prepare the certificate for the President of the Association’s authenticating signature. When signed, the certificate and medal will be forwarded to the host Army school for presentation. Award recipients will be published in “1775″ and on the official AGCRA website. The medal and certificate should be presented at the respective course’s graduation ceremony.